April in Santa Fe has flown. It's been such an eventful month, keeping the blog up-to-date has been a challenge. So, here's a somewhat brief recap of our stay. 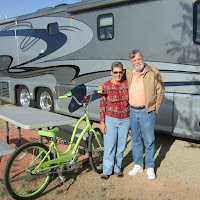 We arrived at Santa Fe Skies RV Park on April 1st right behind our friends Gene and Anne. We met these good folks in Kerrville and were pleasantly surprised to discover we were headed for the same park on the same day. 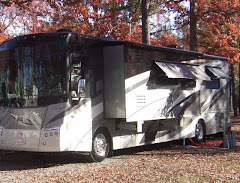 We enjoyed their company for the first few days of our stay, then they were back on the road toward their home in Missouri. We look forward to crossing paths again when we're in their neck of the woods. 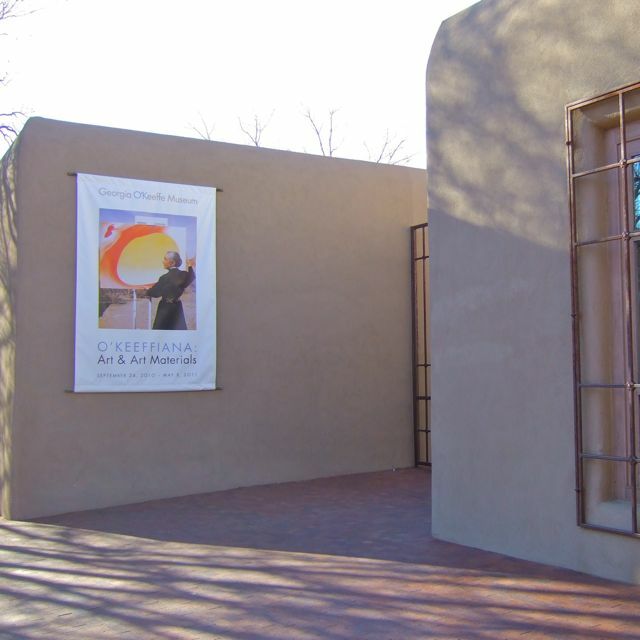 Many of Santa Fe's museums offer free admission on Friday evenings. 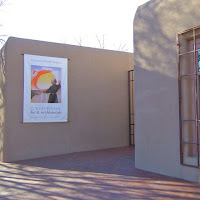 On the first Friday of each month the Georgia O'Keefe Museum opens its doors for a free evening. Turns out our arrival day coincided with the first Friday. In very uncharacteristic fashion, we headed out shortly after we setup and did a tour of Georgia's place. We enjoyed the gorgeous display of her work and learned a thing or two about this inspiring woman's life. It was all very interesting. And, the price was sure right! 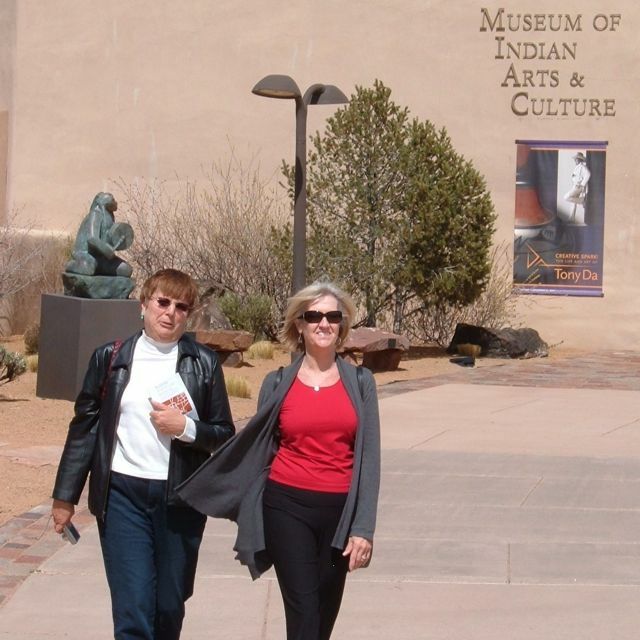 It was a very pleasant evening, so we strolled from the museum to Old Town Santa Fe. 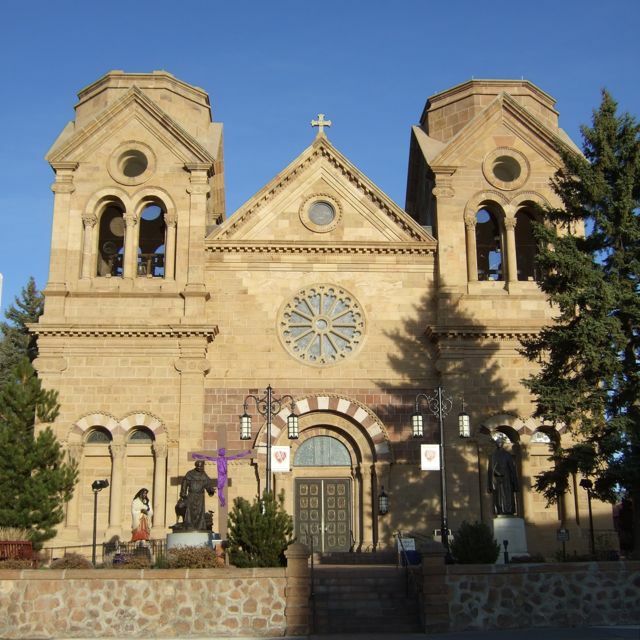 The predominant downtown landmark is the Cathedral Basilica of St. Francis of Assisi, located just off the plaza. 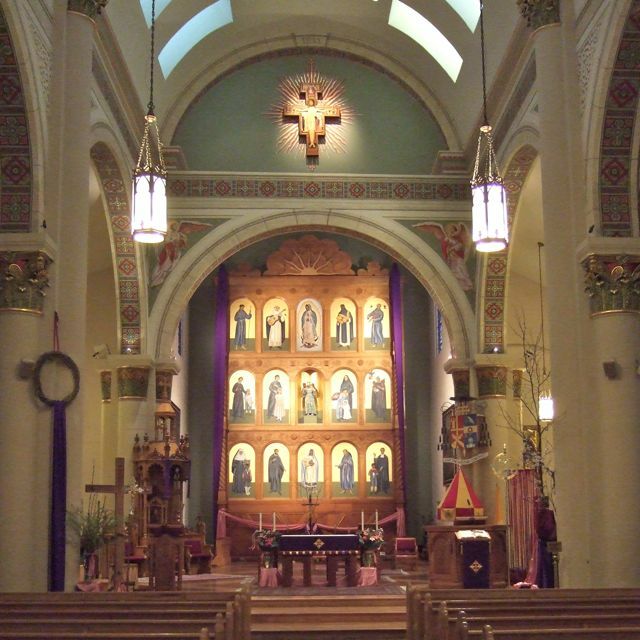 When construction began in 1869, the cathedral was built around the original adobe church. Plans called for tall spires on each side, but when construction funds ran out they were omitted. The result was a striking French Revival that definitely stands out amongst the old adobes and looks a bit unfinished. 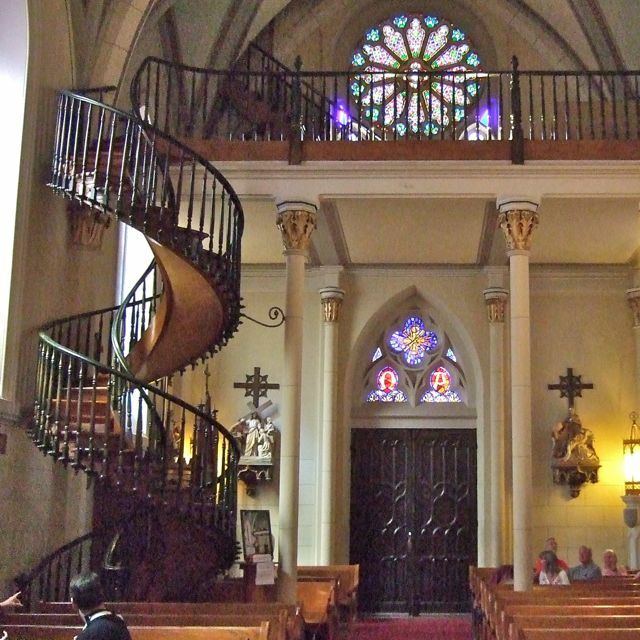 The cathedral is an integral part of Santa Fe history. 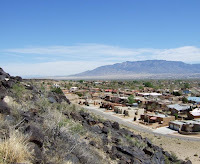 The Catholics showed up in 1598, a dozen years before the city was founded. 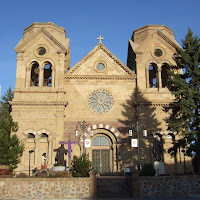 The original church was erected in the city's founding year and named after Santa Fe's patron saint. The interior is majestic and immense. Despite its size, it is a very peaceful place that invites visitors to pause, reflect and pray. The cathedral is home to an active parish and is used daily. During our Friday night visit, a young couple was running through their wedding rehearsal in a side chapel. 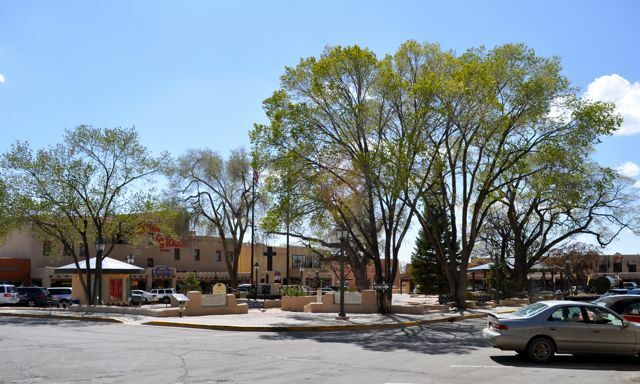 Our first weekend in Santa Fe turned out to be some of the best weather days of the month. On Saturday, we headed out with Gene and Anne and checked out the Santa Fe Farmer's Market at the railyard. The four of us headed to Old Town to check out the Loretto Chapel. 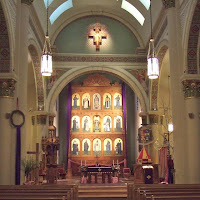 Shortly after the Santa Fe Cathedral was completed, the Sisters of Loretto decided to build a chapel for their Academy of Our Lady of Light. The chapel served the school for some 90 years. The school closed in 1968 and the chapel was deconsecrated shortly thereafter. Today, the chapel serves as venue for weddings and special occasions. 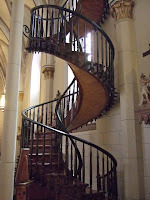 It's primary purpose, however, is a museum for "The Miraculous Staircase". 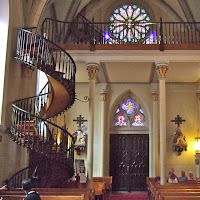 The staircase, which legend says was constructed or inspired by St. Joseph the Carpenter, was built sometime between 1877 and 1881. It took at least six months to build, without a single nail, and has two 360-degree turns with no visible means of support. No matter how it came to be, it is a magnificent piece of craftsmanship. 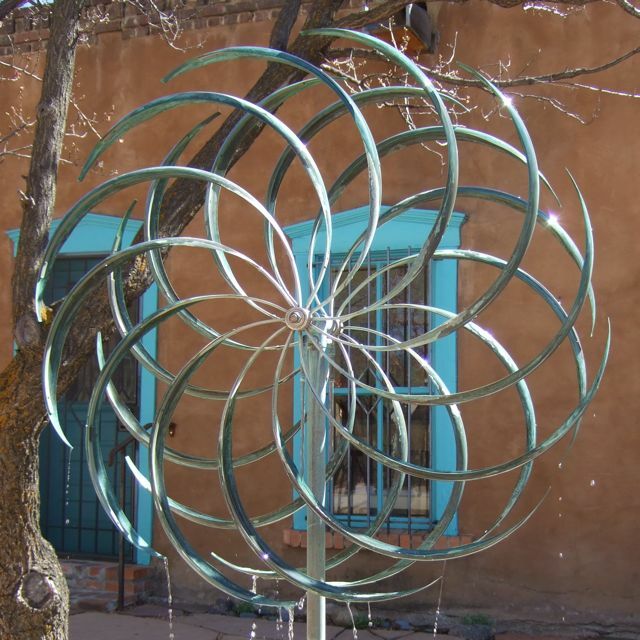 There's no doubt that Santa Fe is an "artsy" town. 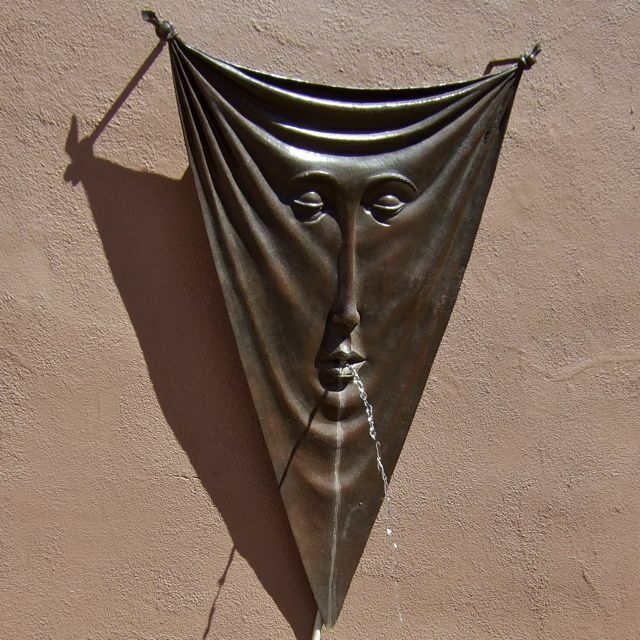 Visitors don't have to look far to see beautiful and unique sculpture, jewelry, silversmithing and other works of art. Artists, it seems, are everywhere! 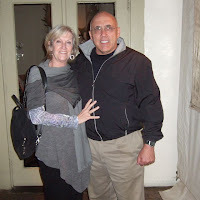 Dear friends Rick and Cindy arrived from the Bay Area to spend a few days with us in Santa Fe. 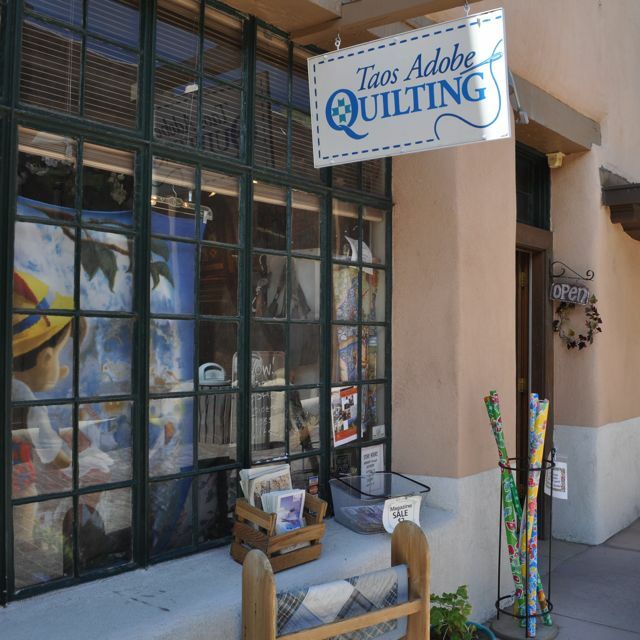 We spent a sunny but breezy afternoon perusing the many galleries along Canyon Road. These intricate weaves were stunning. 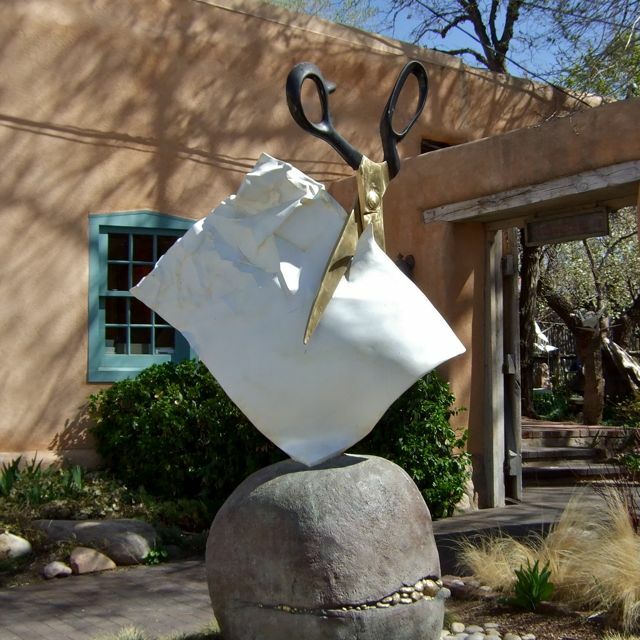 With the New Mexico sun shining brightly, it was easy to spend time outside the Canyon Road galleries admiring the sculptures. This work is a delightful interpretation of the old game of Roshambo. One of our favorite stops was a gallery with a very moving sculpture garden. 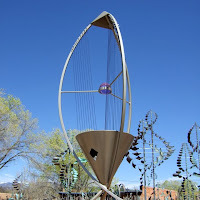 Dozens of wind sculptures quietly danced while this wind harp hummed melodically in concert with the breeze. Rick and Paul basked in the sun in these solid rock chairs, which were amazingly comfortable. It was the next best thing to a hot stone massage! As the afternoon breezes began to cool, we decided to get out of the wind and head to Museum Hill for a visit to the Museum of Indian Arts & Culture. 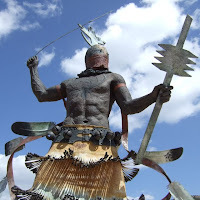 The museum entrance is "guarded" by this great Apache warrior. 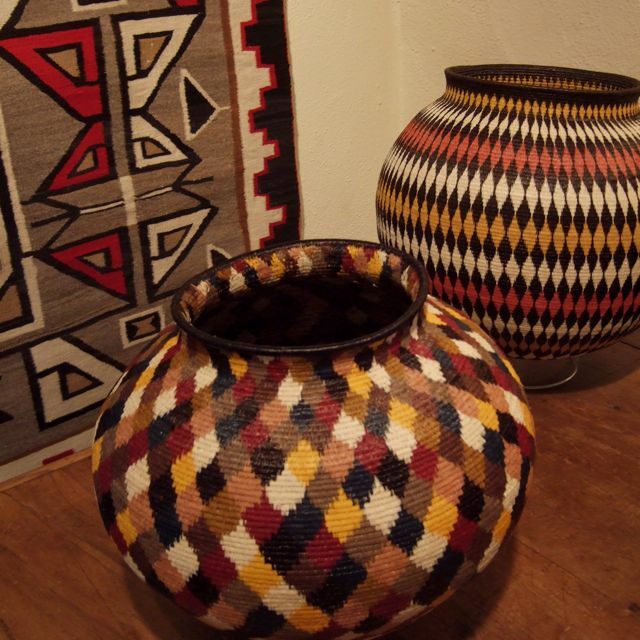 Here, Now and Always is a long-term exhibit that tells the story of the native people of New Mexico. 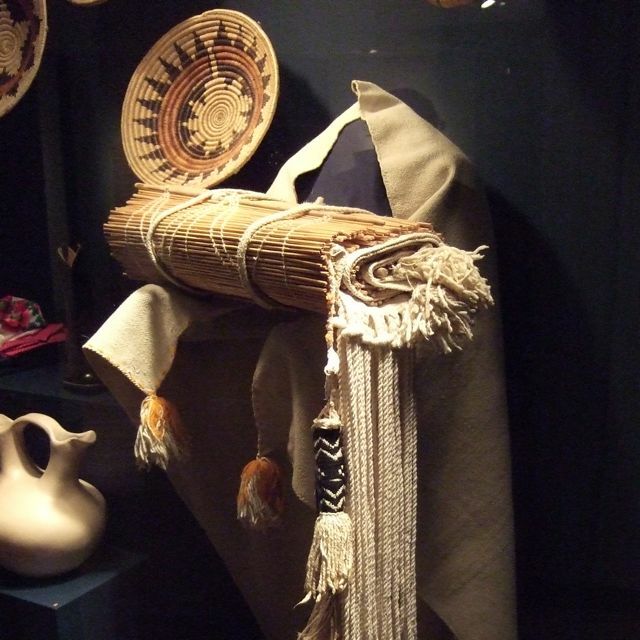 The voices of 50 Native Americans guide visitors through displays of more than 1,300 artifacts accompanied by poetry, song, story and historical discussion. Among the tools and treasures of the southwest is this beautiful display of a Hopi woman's wedding presentation. While our days with Rick and Cindy were spent touring galleries and museums, the nights were filled with fabulous food. 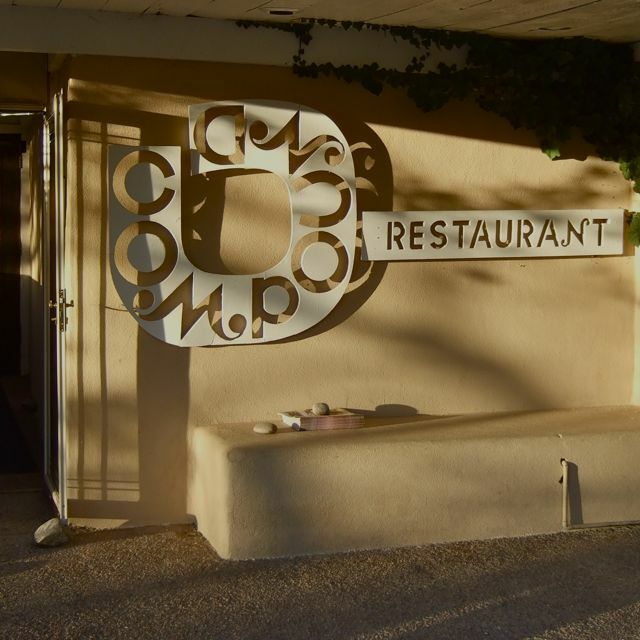 Together we enjoyed three of Santa Fe's finest restaurants. It's tough to pick a favorite. But, if we have to, we choose The Compound on Canyon Road. Everything - the ambience, the food, the wine, the service - was exquisite! 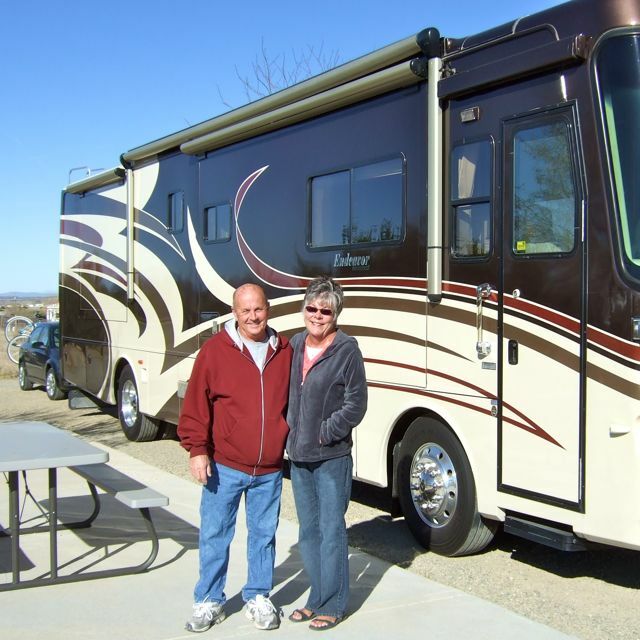 By the time Rick and Cindy headed back to California, the four of us were in a serious food coma! We so enjoyed our time with these fabulous friends. Thanks so much for getting away for some fun in Santa Fe, guys! After consuming all of those calories, we've made an extra effort to get out and exercise. 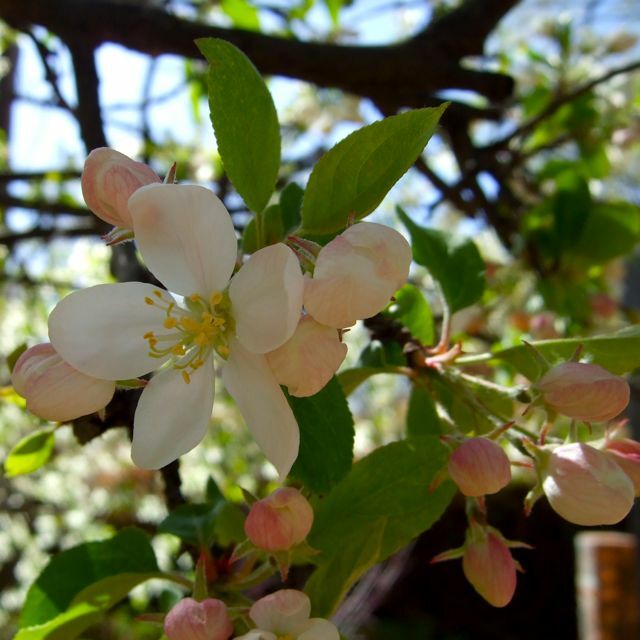 During our much-needed daily walks, we've especially enjoyed watching Santa Fe come into bloom. 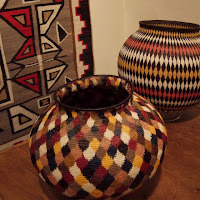 We had the good fortune of timing our Santa Fe visit to coincide with the travels of our favorite Oakland neighbors Mary Kay and Matt. 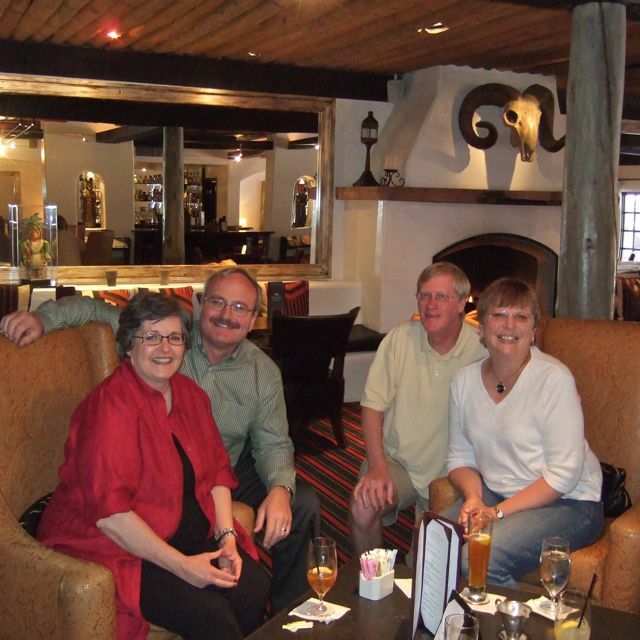 These friends were in Santa Fe for a few days, so we joined them for afternoon refreshments and conversation at their hotel in Old Town. It was wonderful to catch up. We wish these two safe and happy travels as they continue on their southwest journey. 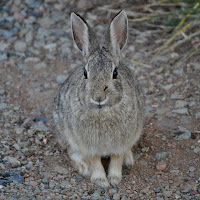 We've spotted many of these fun little creatures in our park this month. 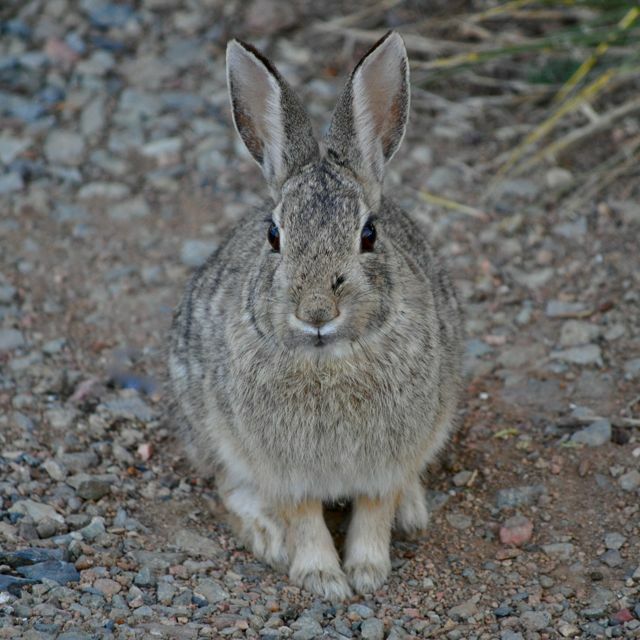 Now we know where the Easter Bunny hangs out in Santa Fe! 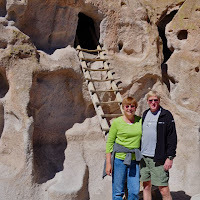 Another special treat was the arrival of Facebook friends and fellow travelers Donna and Keith at Santa Fe Skies this week. 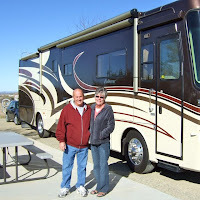 We had yet to meet this fine couple, so it was great to connect face-to-face. Although the weather didn't really cooperate during their visit, they managed to get out to see the sights, have a stroke of good luck, and pick up one really nifty looking new bike. 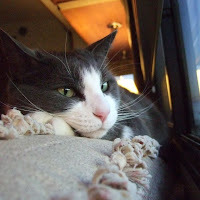 When we haven't been out having fun with all our visiting friends, it seems like we've been dealing with the weather. 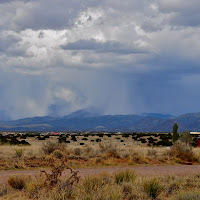 After our arrival, we discovered that April isn't the best month to see Santa Fe. It tends to be a windy time, and this year it's been exceptionally so. Mother Nature has doled out 50-plus mph winds, rain, sleet and snow this month. Sometimes all in the same day! While the extreme weather has kept us inside more than we like, it has provided some dramatic views from inside our moose. 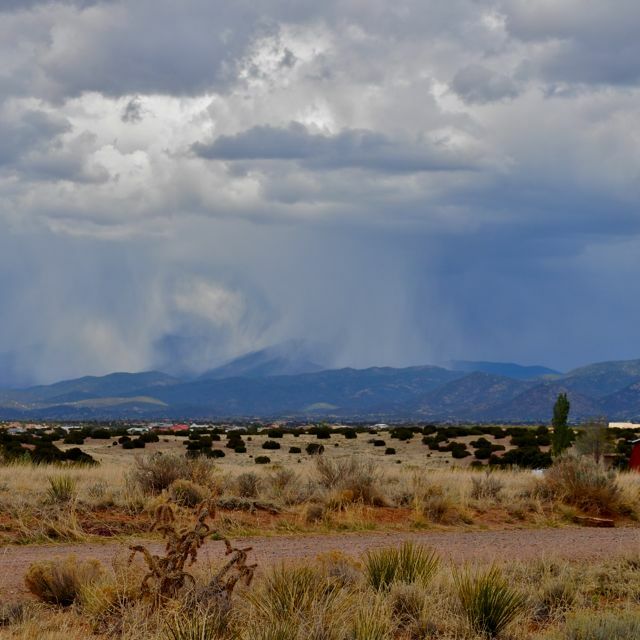 Here shafts of rain and snow drape the not-too-distant Sangre de Cristo Mountains. With all the weather this month, cabin fever is starting to set in. Even our boy kitty is ready to roll. 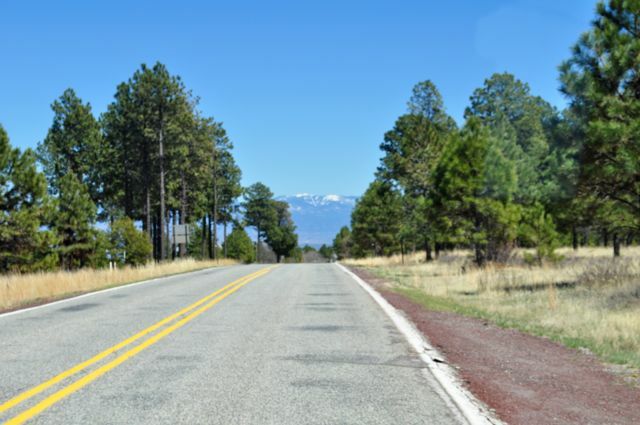 We're slated to head toward the Four Corners area tomorrow. But, with the forecast calling for gale force winds here and snow along our route on the first day of May, we're not sure when we'll get out of here. It is almost May. Isn't it? Today's weather was cool and windy, but we decided to go day tripping despite the weather. 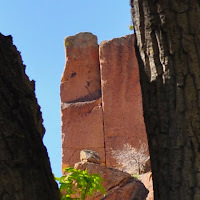 Today's destination was an hour or so northwest of our park, in the scenic Jemez Mountains. 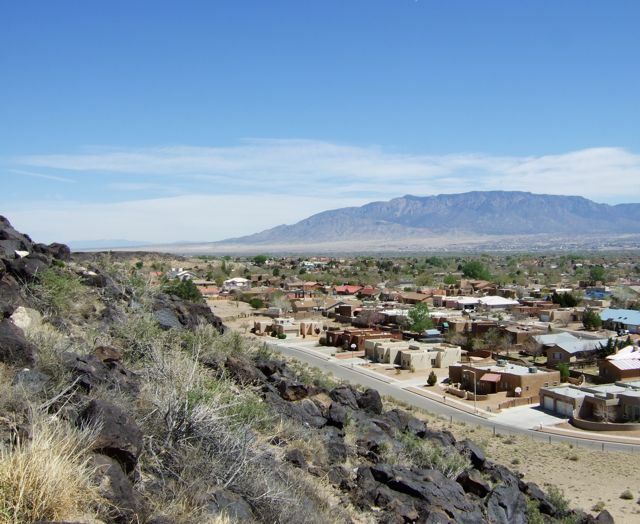 Los Alamos is known locally as simply "The Hill". 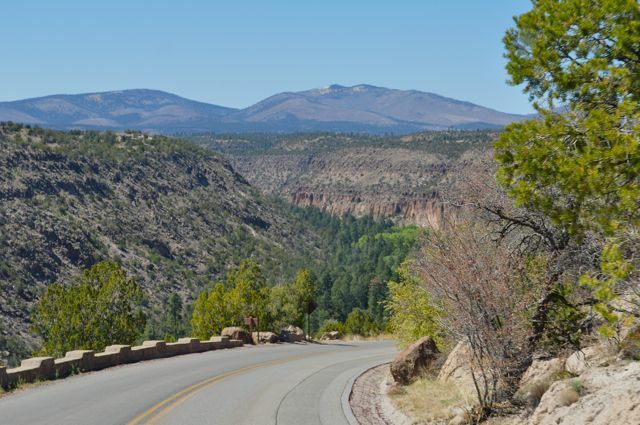 As home to Los Alamos National Laboratory, it's a scenic and particularly "brainy" town. 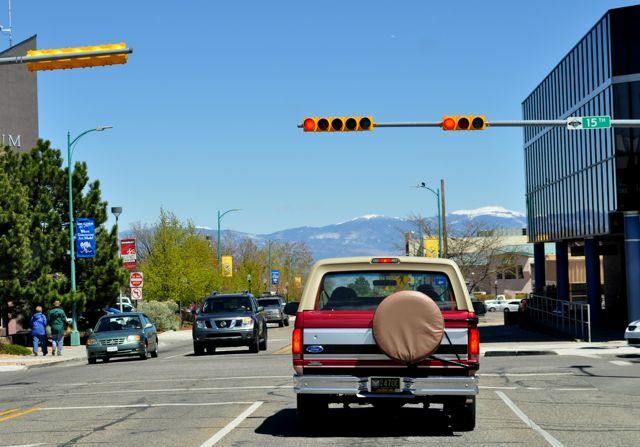 With a staff of nearly 10,000 physicists, engineers, chemists, materials scientists, students and support personnel, LANL is the largest employer in Northern New Mexico. The massive lab, which focuses on national security, covers nearly 40 square miles. 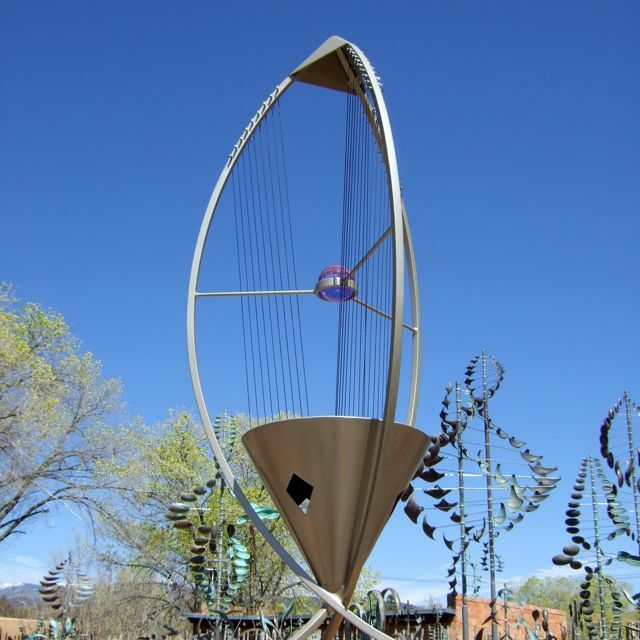 Banners around town proclaim Los Alamos as a place "where discoveries are made." Needless to say, neither of us has proper security clearance to visit the lab. 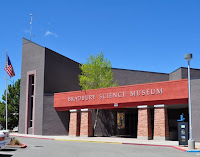 So, we settled on a visit to the Bradbury Science Museum. 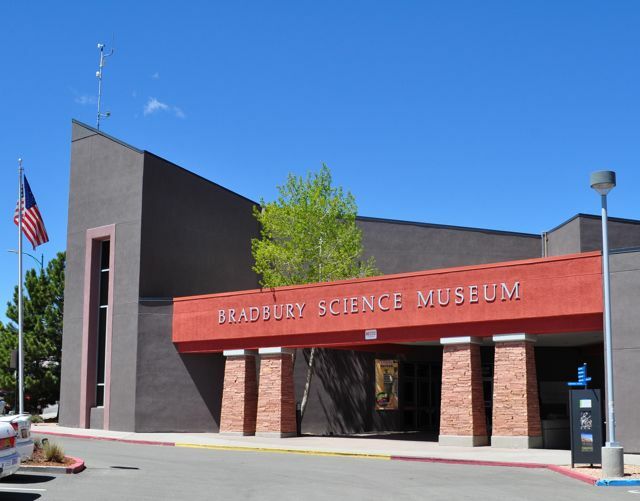 This free museum displays exhibits about the history of LANL and its ongoing science and research. We started our tour with a viewing of a short film, The Town That Never Was, which tells the story of the Manhattan Project and Los Alamos from 1942 to 1945. What a fascinating story! The museum's defense gallery spotlights replicas of the history-changing weapons that were the products of the famous project. "Little Boy", in the foreground, was the nuclear bomb dropped on Hiroshima on August 6, 1945. 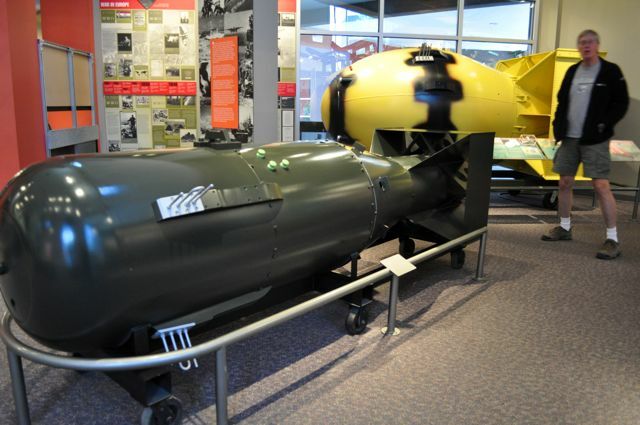 The yellow "Fat Man" was dropped on Nagasaki three days later. After a tasty lunch in Los Alamos, we drove across town - and through part of the LANL complex - to Bandelier National Monument. Along the way, we both commented how wonderful it was to see green trees. Perhaps we've been in the desert a bit too long! 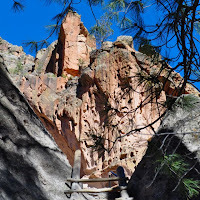 Bandelier National Monument sits in the gorgeous Frijoles Canyon. 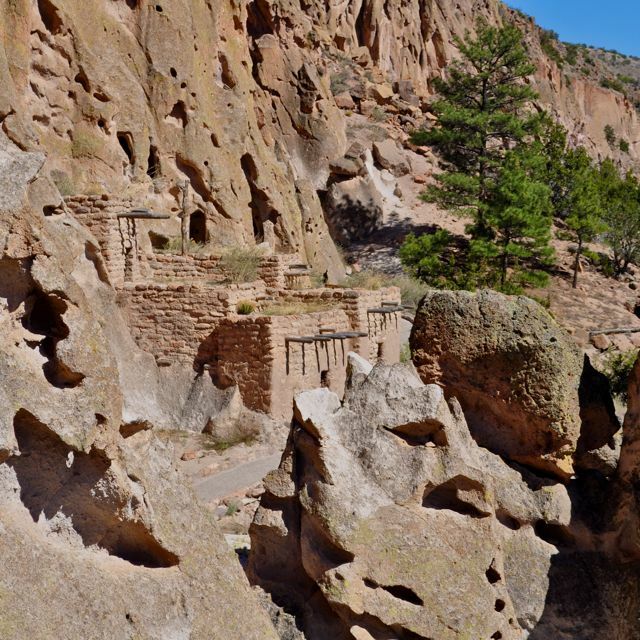 This 33,000-acre spread preserves and protects this ancestral home of the Pueblo people. 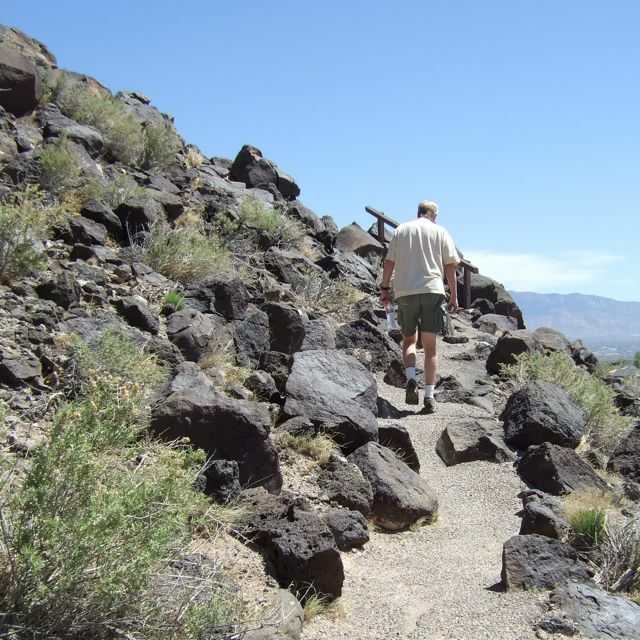 We followed the Main Loop Trail for a hike into history. 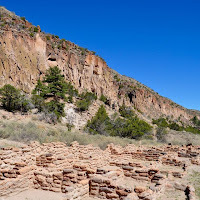 The canyon floor is home to the remains of the Tyuonyi Pueblo. In 1400 A.D., this 400-room one and two-story building was buzzing with 100 residents. The south-facing canyon cliffs contain remains of ancient homes. This talus house was reconstructed in 1920. 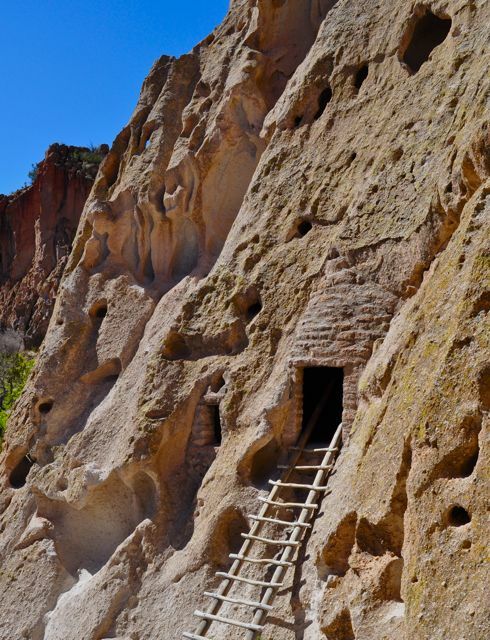 Once upon a time many talus houses, built from rock debris, stood at the bottom of the cliff. 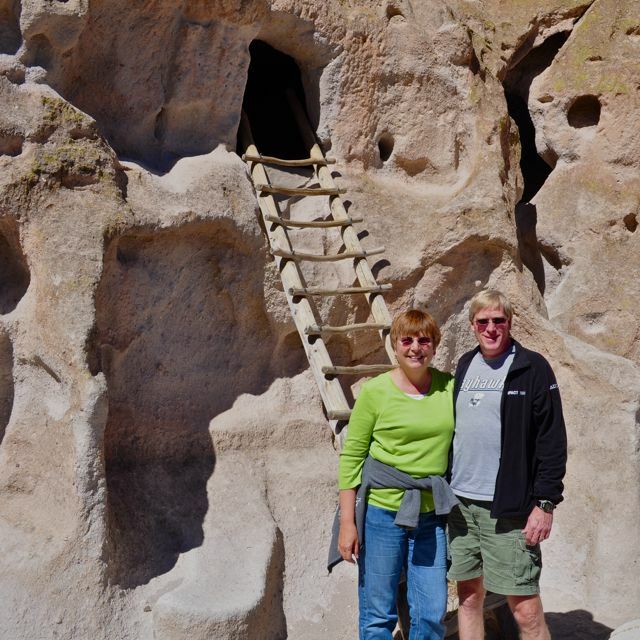 At its peak, it is estimated that Bandelier was home to some 500 residents. 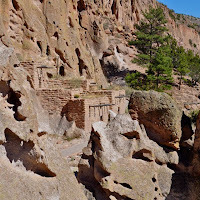 At Long House, the Pueblo people built several multi-storied dwellings along the the cliff base. 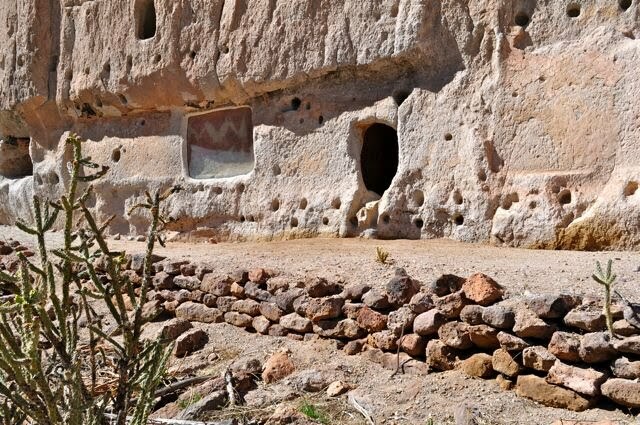 To the left of the entrance to this home is an ancient pictograph that was once part of the back wall of a second-story dwelling. These cave rooms, or cavatas, were dug out of the soft tuff in the canyon face. Ladders were used for entry to the higher rooms. These cave rooms made our 40-foot moose seem most spacious! Did we climb up and look? But, of course! 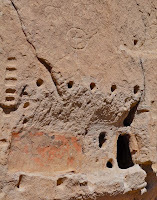 Above the top row of holes in this cave room is one of many petroglyphs carved into the tuff. From Long House we left the Main Loop Trail and headed toward Alcove House. The late afternoon sun gave us some dramatic views of the canyon walls. 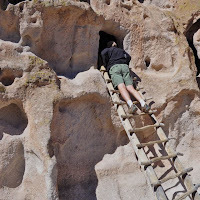 By the time we reached the first of several ladders to make the 140-foot climb to Alcove House, the afternoon was getting late. We opted for this quick shot of the multi-level dwelling from its base. We'll save that climb for next time. As we headed back toward the main trail, we spotted two bear cubs playing near Frijoles Creek. 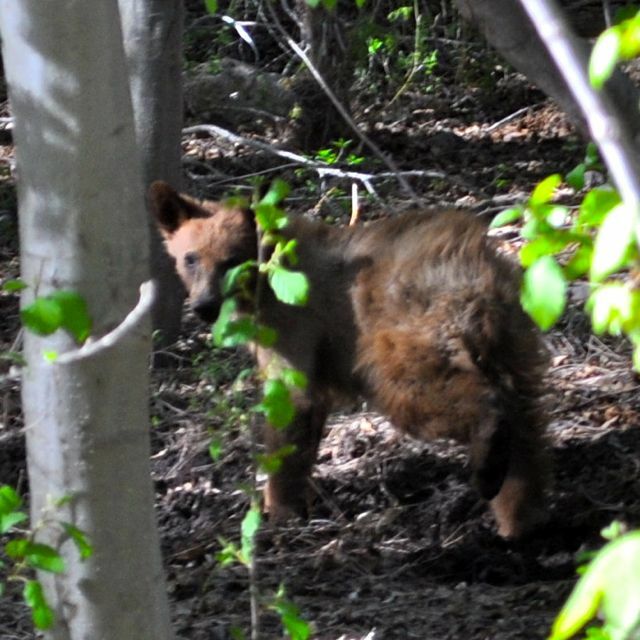 This is one of the cute little pair digging around just 30 yards or so off the trail. I didn't take much time to frame the shot, as we figured "mom" was close by and we had yet to spot her. There she is! 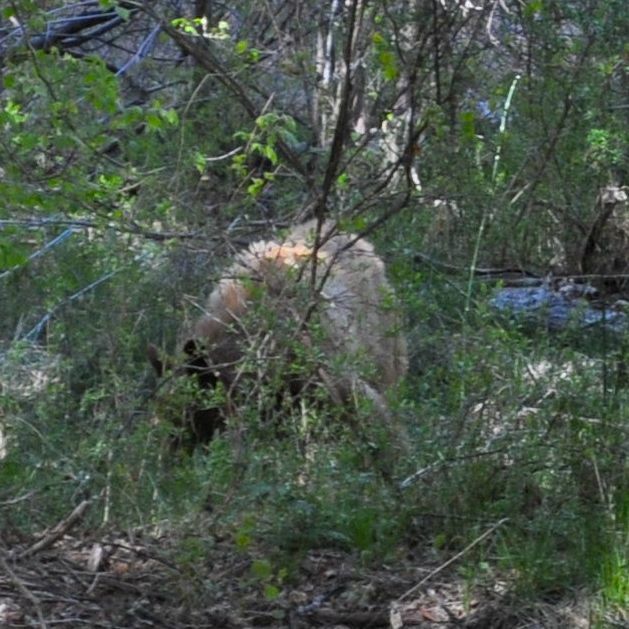 Mama was just a few yards past her babies, munching on some grass. She raised her head and looked us straight in the eye. Suddenly, she looked much bigger! 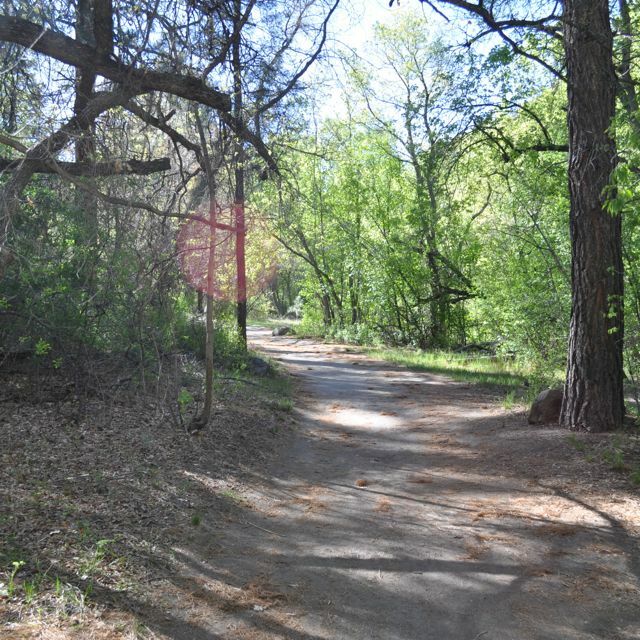 I missed getting that shot as instinct kicked in and my feet were moving slowly but surely down the trail in an instant. Back on the trail, we enjoyed the last of the late afternoon sunshine on a day that, despite some chilly temperatures and a bit of wind, turned out to be a wonderful day. 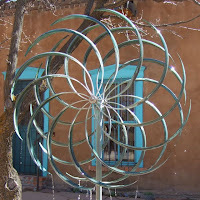 Windless days have been few and far between here in Santa Fe. With a rare calm afternoon, we decided to make a quick run to Taos. 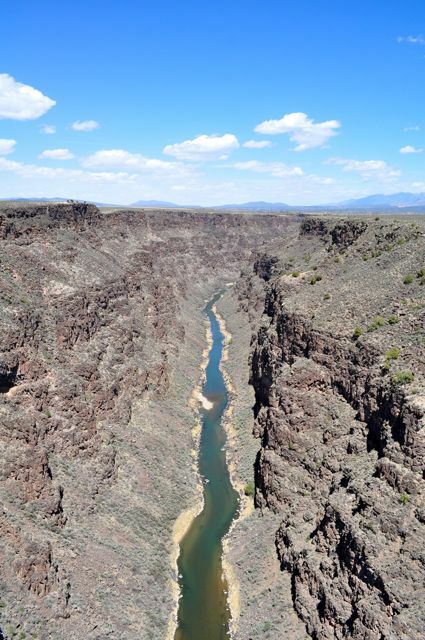 It was a beautiful day to enjoy the 80-mile trek to this very scenic part of northern New Mexico. Our first stop was the Gorge Bridge, about 10 miles northwest of town on US-64. The 1,280-foot span was named the most beautiful long span steel bridge in 1966, one year after its dedication. As impressive as the bridge is, the gorge is the real star. 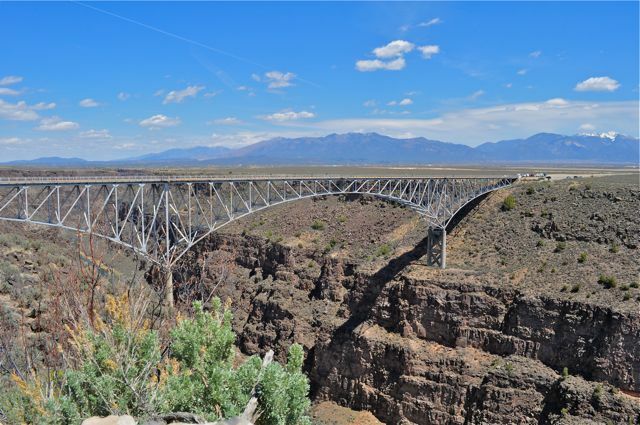 The Rio Grande River flows some 650 feet below the steel span, making this the fifth tallest bridge in the United States. 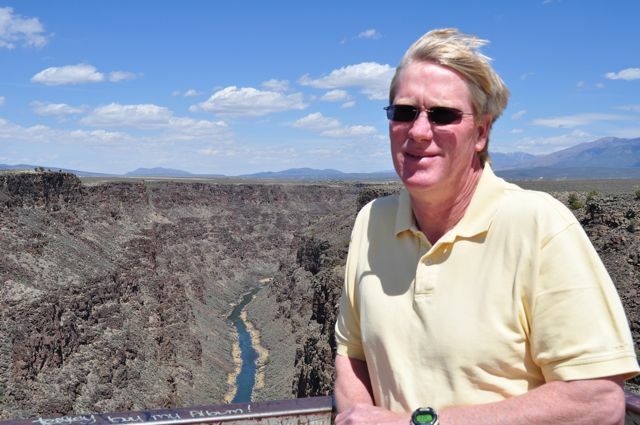 Have we mentioned that it's been really windy here in New Mexico? The center of activity in the town of Taos is the town square. 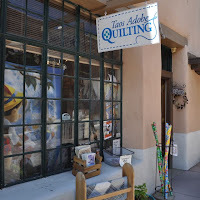 It's surrounded by adobe-style hotels, restaurants and shops. 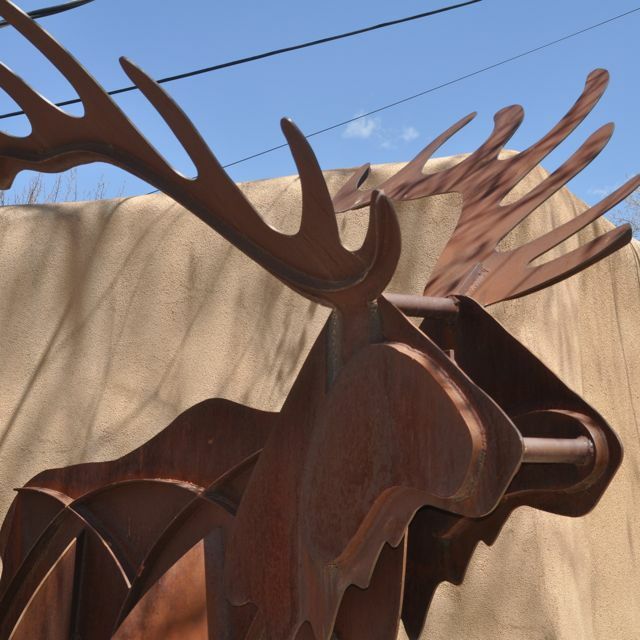 Like Santa Fe, Taos is a very "artsy" town. Jewelry stores and galleries abound, so you don't have to go far to find something that catches your eye. While strolling down a quiet street we spotted this sculpture that looked quite Bullwinkle-like! 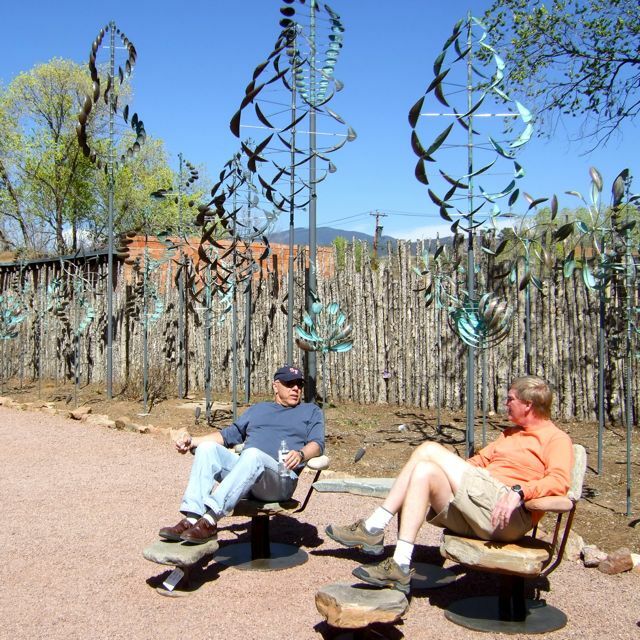 One sunny afternoon in Taos is just enough to get a taste of the place. We look forward to making a lot more time for our next visit. 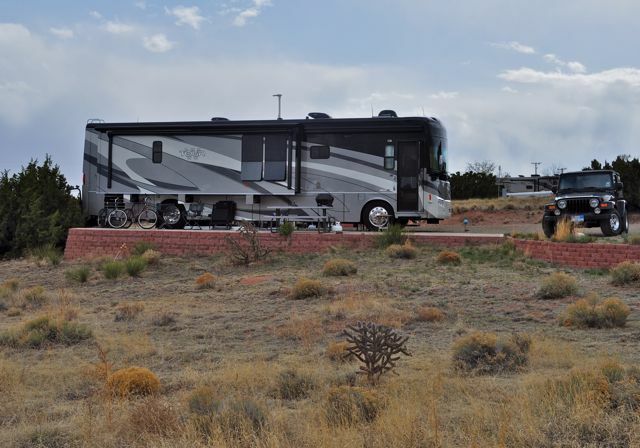 After spending the first few days of our month in Santa Fe settling in, we headed south for Albuquerque. The agenda for our day trip included shopping, sushi and sightseeing under the blue skies of this sprawling city. 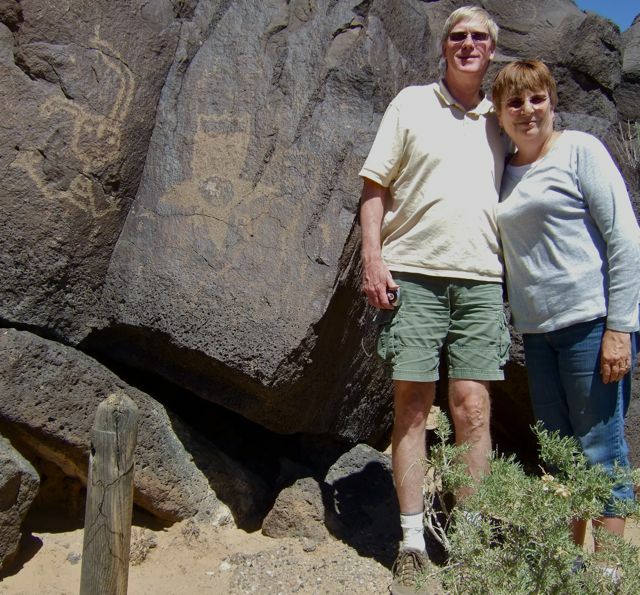 Our sightseeing activity for the day was a visit to Petroglyph National Monument. The 7,200-acre area was set aside in 1990 to preserve and protect more than 25,000 rock carvings in a 17-mile cliff of dark basalt boulders. Archeologists believe many of the petroglyphs date back at least 3,000 years. 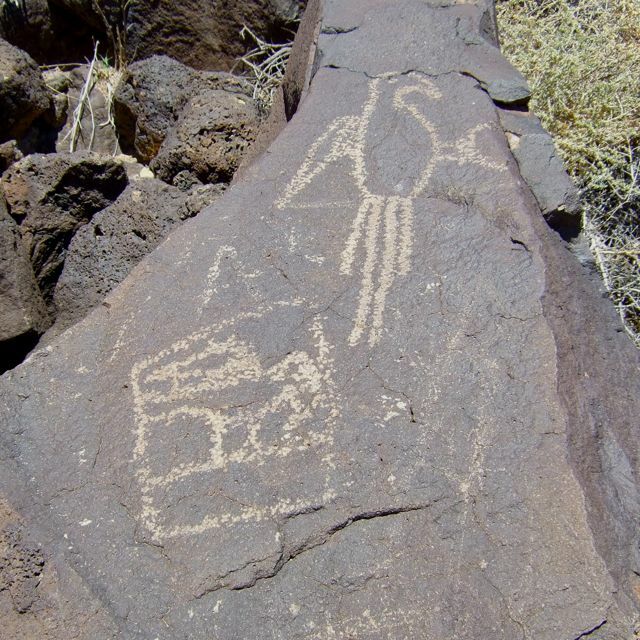 The monument's Boca Negra Canyon features three developed trails that provide access to some of the most accessible petroglyphs in the park. The trails were short, but steep! The 200 or so petroglyphs along the Boca Negra Canyon trails represent just 5% of the carvings at the monument. 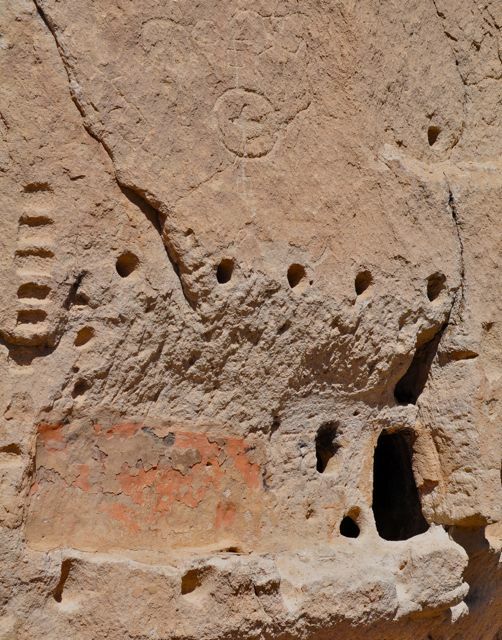 Most of these carvings were created by Pueblo Indians using the Rio Grande style, which was developed about 1300 AD and continued through the 17th century. 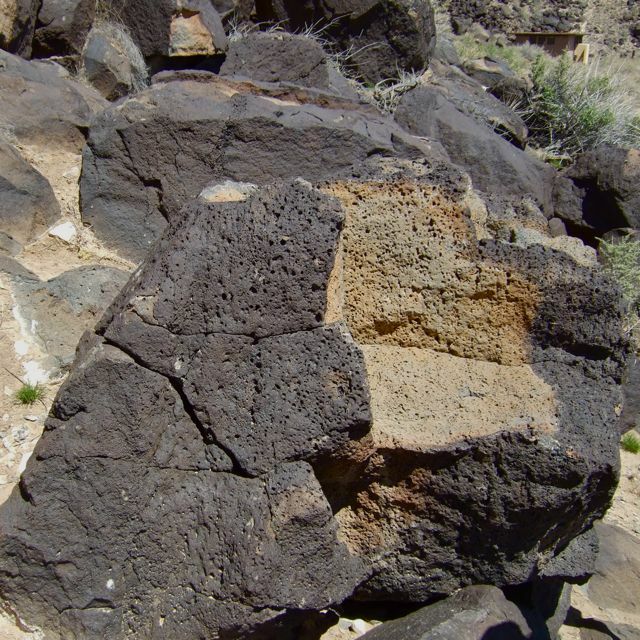 A closer look at this "broken" boulder explains how the petroglyphs got their color. As the monster rocks were exposed to water, sun, heat and cold, minerals on the surface oxidized to create a thin dark patina of "desert varnish". When people chipped through the patina, it revealed the lighter colored rock underneath. 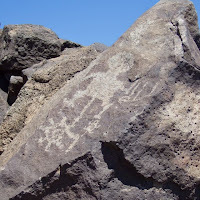 Images of the Rio Grande style include human figures, animals, plants and geometric shapes. 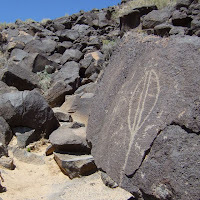 Nobody knows for sure what the petroglyphs portray. 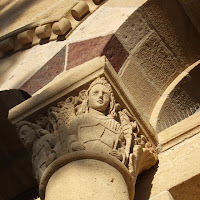 But, it's fun to imagine the centuries-old stories behind these images. 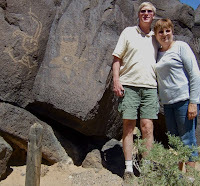 We enjoyed our afternoon of climbing around the "talking rocks" at Petroglyph National Monument. 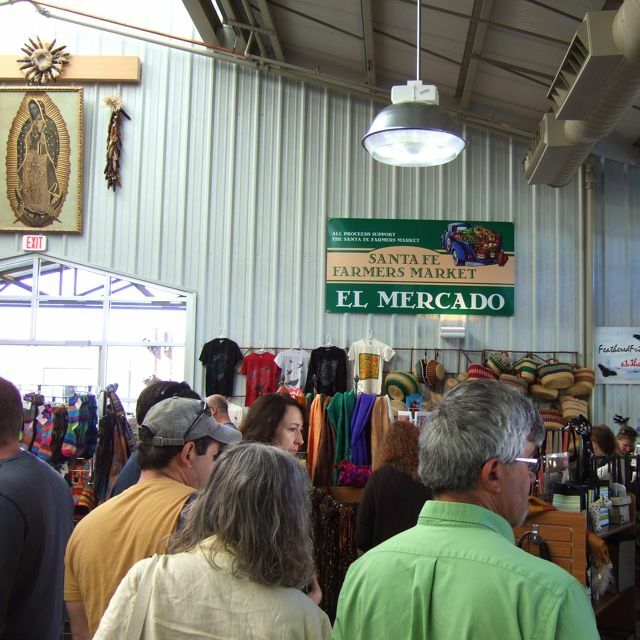 If you find yourself in or around Albuquerque, we highly recommend a visit.